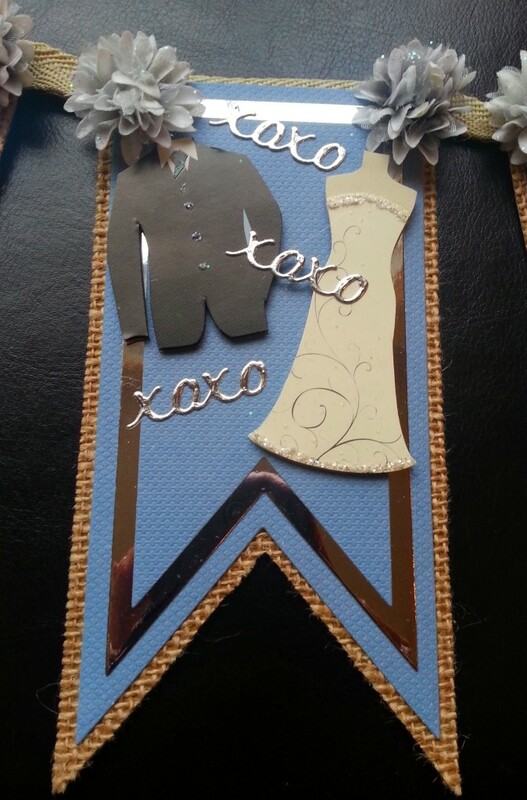 My crafty friend, Kendra (YT: Kendra Nolen) is getting married. Woot woot! 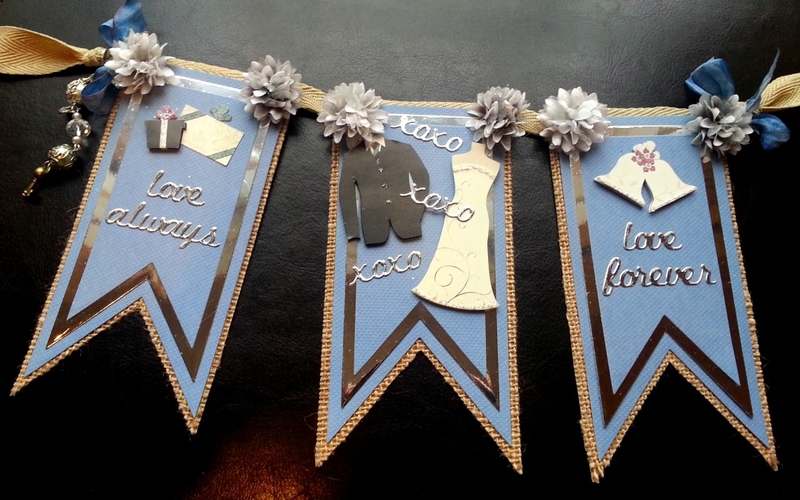 She is currently hosting a wedding banner challenge and asked folks to make a pennant or a banner. She listed some of the likes of her fiance and herself as guideposts, so I took it from there. I used the steel blue, silver and burlap colors, my awesome Diemond Dies Fishtail Nesting Banner Set and the new Word Die Set #1 and just had fun! I cut the steel blue Bazzill card stock and silver foil card stock using the largest 3 fishtail banner dies. Then to make the banner a little more substantial, I backed it with some hand cut burlap paper by DCWV. I traced around the outside edge of the largest die to make it slightly larger and I was able to get 2 pennants from each 6″x6″ piece of paper. 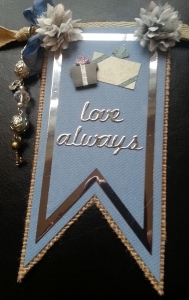 I used little scraps of the 1 sheet of foiled silver paper I had to cut out three – “xoxo” die cuts, two – “love” die cuts, one – “forever,” and one – “always”. This word die set has 10 really useful words! There is a Diemond Dies SALE going on through November 2014 and everything (except the latest release) in the store is on sale at least 10% (some 20%). PLUS, if you use the code “thankskristina” you will get an additional 10% off and free worldwide shipping on orders of $35 or more. 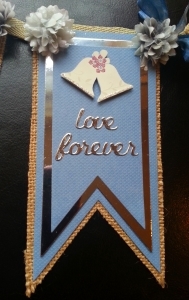 These words were perfect for this wedding banner. I then got out some wedding stickers that I had left over from scrapping my wedding (I made 4 albums for my parents, in-laws, GIL, and us) 6 years ago. I picked out some clean and simple images and fussy cut them out a couple of times so I could avoid the borders and layer them for some dimension and interest on the banners. What I am most proud of is the upcycling I was able to do with some simple fabric ribbon that I salvaged from some the packaging around some sheets I had purchased at pottery barn a long time ago. This was the same color as the burlap and the rougher texture seemed to complement that nicely. I just used some hot glue to adhere the tops of each pennant to the ribbon folded over the top. This seemed very secure and I didn’t have to trouble with punching holes and using eyelets (bonus, since I had run out of eyelets)! Lastly, I decided to add some extra trimmings by hot glueing on some steel grey and silver Prima flowers with glitter at the top corners of each pennant. To “finish” off the ends, I also used the last bit of my favorite blue hand dyed seam binding I had purchased from the very talented Candace Scarborough (she sells this gorgeousness at her Etsy store, OnlyOneLifeCreations, for great prices to raise money for mission work). Well, I thought I was done and posted the following video, but I wanted to add a little somethin’ somethin’ more. 🙂 If you look at the top picture I added a dangle with some beautiful glass and metal framed beads, grey pearl beads, and special charms. Kendra and her fiance are Disney fans so I added two Mickey keys that I had in my stash as well as a little heart with a key hole in it that says “made with love.” I hope they like this banner and that their marriage is made with love and that that love endures always and forever. LOL I’m a sap! What a fun idea! Your banner turned out really elegant! I like the colours and the little details! Thanks for playing with us at Challenge up your life! Kristina, I love the dichotomy of the burlap and elegant gold layering in these tags. Thanks for joining us at the Craft-Dee BowZ November challenge. You already know about our Diemond Dies giveaway, so spread the word! Just a few more days left. Hi Kristina, great take on the challenge theme! I like the colors you’ve chosen. Thanks for playing along over at Challenge up your life! See you soon!